A software product is termed ready only after going through various stages of software testing. From its internal structure and code to its basic features, functionality, performance, and more, every major and minor component of the software is tested to guarantee its quality as well as its effectiveness. Black box testing, which is a critical testing technique, is performed to validate the functionality of the software product, based on the specifications provided by the client before the commencement of the project. 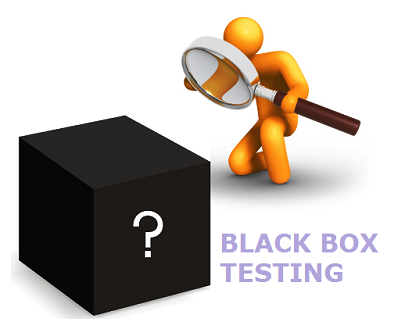 Therefore, to get a better insight into this type of testing, here is a detailed discussion on black box testing. Black box testing is a software testing type, wherein the testers have no knowledge of the internal structure, design, and code of the software. The sole focus during this type of testing is to test the functionality of the software and ensure its conformance with the specified requirements. It is because of this reason that black box testing is also known as specification based testing. Moreover, black box testing gets its name from the concept of a black/opaque box, through which one cannot decipher the internal contents of the box and can only visualize and examine its external appearance and structure. In short, black box testing is used to verify and validate the correct and smooth functioning of the intended functionalities without digging and evaluating the internal structure of the system. In the given diagram of a software application, it may be seen that only external structure needs to be tested comprising of intended functionalities: A, B, C, J,K,L, X,Y, Z, P, Q and R, and internal structure & framework of the system need not to be considered for black box testing. If the intended functionalities are functioning expectedly without any issues, the application overall is considered to be acceptable for further process. It is a type of functional testing. 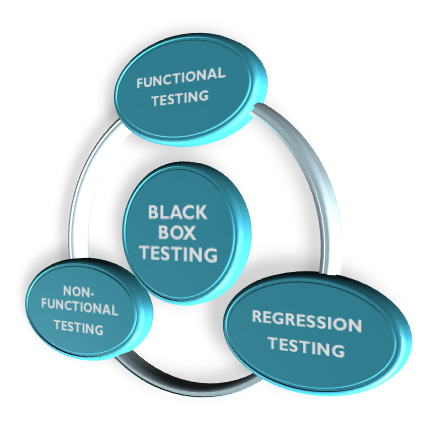 Black box testing is performed by an independent testing team during software test life cycle. In this type of testing, software tester do not have in-depth programming knowledge. Here, only valid and invalid inputs are provided to get the desired and expected outputs. Testers thoroughly compare the actual output with the expected output, which further helps in reducing the number of defects in the functionality of the system. It is strongly related to agile methodology. Tests are performed from the user’s point of view. Functional Testing: The most favoured mode of Black Box Testing, functional testing focuses on the specifications of the software under test, namely, the core application functions, menu operations, or the Installation/setup package. From a customer's point of view, it's the most crucial test, which makes sure sure that they get features and services worth their money. Non Functional Testing: Other than seeing to it, that the software works true to its marked specifications, it's equally important to gauge behavioural aspects like reliability and scalability. That's where non-functional testing does a fine job. Regression Testing: In the aftermath of an upgrade/patch, a software may inevitably suffer a glitch called regression. Regression testing is just the right medicine to avoid such an eventuality. Unit Testing: During this stage of testing, the method of black box testing is used to evaluate the interface of the software as well as the specifications offered by the client before the commencement of the project. Integration Testing: In integration testing, the aim of testing is to determine the issues and errors in the interface and interactions among the integrated components of the software. System Testing: Knowledge of inner design and code of the software is redundant in this testing, as it evaluates the system’s compliance with the requirements specified by the client. Acceptance Testing: The aim of testing here is to validate the acceptability of the software by testing it in various unprecedented and unanticipated situations and circumstances. What are the test design techniques in Black Box Testing? There is no dearth of options, when it comes to Black box testing. Here's listing a few of them. Error Guessing: Here the tester depends on his past experience and Sixth Sense, as they say, to devise test cases based on what he feels, is likely to cause system failure or bugs. Read complete details in our related article error guessing. 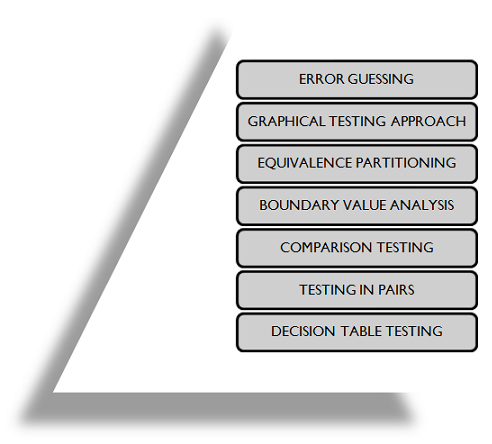 Graphical approach to testing: The software being tested constitutes a range of different objects. A test case can then be formed through relationships between these objects, derived from the graphical data. Alternatively, a cause and effect graph can be arrived at, with the help of feeding inputs and subsequent monitoring of the response. Equivalence partitioning: The test case is built from the different smaller classes of data, obtained by the division of entire input data. Plus point of equivalence partitioningequivalence partitioning approach is the reduced number of test cases, resulting in overall reduction of testing time. Analysis of Boundary Values: After the division of input data into equivalence partitions, a range is selected having minimum & maximum values. The boundaries of these partitions are favoured, due to the fact that, most of the bugs encountered are located here. The test case is then built on these extreme values. Gain more insight to this technique in our article boundary value analysis. Comparison testing: Test case borne out of the comparison of application's individual parts. Visit to our article comparison testing to gain better understanding of this technique. Testing in Pairs: Test case deploying all possible computed combinations of input parameters, after divided them in the form of pairs. The input parameter being talked here can be a software algorithm. Decision table testing: A decision table usually relates conditions to actions. Test cases which render embedded if-then- else statements from programming languages into decision tables can come handy while Debugging. Learn this approach with the help of an example in our related article decision table testing. Advantages of Black Box Testing. Black Box testing enables smooth implementation of an application in its original system environment. Fits perfectly with functional testing. A full knowledge of functional specifications enables a fairly quick designing of test cases. As BBT employs a methodology, in which there is no prior knowledge of internal structure/code, it is well suited to simulate a cyber warfare attack, while devising security applications. It does not require knowledge of programming languages as well as system implementation. This is an unbiased and unprejudiced testing, as the designer and testers work independently in isolation. It can be easily performed by non-technical testers, developers, as well as end users. Helps identify any ambiguities, vagueness, and contradictions in functional specifications. 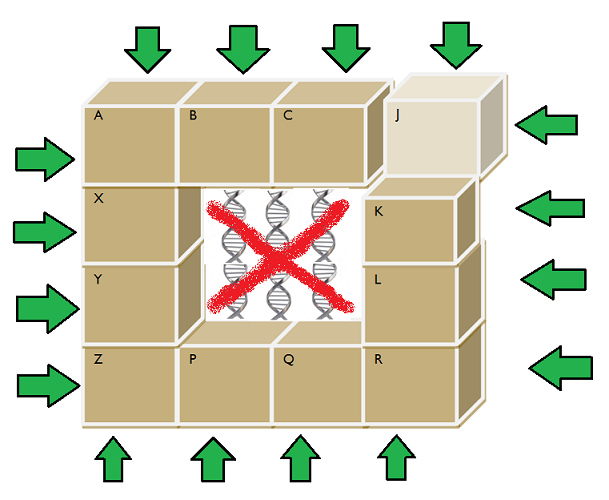 Black Box Testing : Disadvantages . Working with a huge Sample space of test inputs can be exhaustive and put a drain on time. Besides, the probability of meeting dead ends in an unspecified path during testing is pretty high. It tests only a small portion of the of the software, as testing the software thoroughly can be time consuming. Because of black box testing dependency on specifications, it is difficult to design test cases without well defined, precise, as well as concise specifications. Tests in black box testing can be termed redundant if they are already executed by the software developer or designer. Results offered by black box testing can often be overestimated. It cannot be used for testing complex codes and softwares. Black Box Testing is a productive approach of testing the application which not only ensures the qualities of the intended functionalities from user's perspective but also avoids and save the time and efforts, required in exploring and gaining insights to the system for the purpose of testing. For a detailed comparison of black box testing and white box testing, click here.